Ready for that classic semitone ‘lift’ for the last chorus? The Transpose Track makes it easy. Cubase’s audio transpose features open up some interesting creative possibilities. The ability to transpose parts after they’ve been recorded can be useful for a number of reasons, and Cubase offers a number of tools that make this possible, for both MIDI and audio. In the article that follows, I’ll run through a few examples to help you get started. Tucked away under the Add Track menu option alongside Cubase’s other track types is the Transpose Track. As a broad-brush tool for transposing your entire project or just a specific section of it, the Transpose Track is easy to use and very useful. Once added to your project, the Pencil tool lets you add transpose events (they look a bit like an empty MIDI clip). These extend from the insertion point to the end of your project or, if there is one, the next transpose event. Located bottom-left of each event is the transpose setting; hover the standard cursor over this value, and then click and drag up/down, and you can set the transpose value up/down in semi-tone steps. An obvious possibility — something of a pop cliché — would be our old friend the key change: place a transpose event at the start of that final chorus and set its transposition value to 1. On playback, every track, whether MIDI or audio, would be transposed up by a half-step. And, providing you don’t have too many sustained notes that span the transition, this kind of modest pitch change will be handled very gracefully, with few unwanted sonic artifacts. There are a couple of additional things to note, though. First, before you start adding transpose events, it’s a good idea to set the global key for the project. (Do this in the Project window’s Tool Strip, and if the option is not displayed, you can switch it on via the Tool Strip’s Setup dialogue). This ensures the correct handling of any commercial loops you’ve used that have their original key information embedded (you can check whether they have in the Pool). 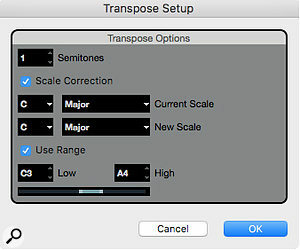 Second, you’ll probably want to exclude any drum, percussion or sound-effects tracks from the transpose process. This is easily done via the Global Transpose setting in the Info line at the top of the Project window. For each audio or MIDI clip, this can be toggled between Follow (the default) and Independent values. If you select all of the MIDI and audio clips that you want to ignore the Transpose Track, you can toggle them to the Independent setting with a single click. The rhythmic feel might be OK, but eight bars of Cmaj7 is perhaps not the most interesting dance chord sequence ever created! Another common application for the Transpose track is more corrective than creative; finding the right key for your singer. There are lots of producers who create musical beds and then hire in a singer to add the top line. A single transpose event at the start of the Transpose track can be a great help in finding the ideal key for the singer’s range. If this requires more than a few semi-tone steps in either direction, some re-recording of the backing tracks (particularly audio tracks) is advisable, but at least you have an easy way to find your singer’s comfort zone. Another practical role for this technology is helping a vocalist hit the high notes: if the key is just a step or two too high for the singer to get the top-most notes, you can drop the whole arrangement down by the step(s) required while tracking the vocals, before simply returning the project to the original key: the vocals will be pitched up accordingly. The colour-coding of notes on the piano roll doesn’t have to relate to velocity — it can also display key/scale/chord information relating to the Chord Track.Not all of us are blessed with great keyboard skills, and while Cubase offers all sorts of ways to assist you in creating MIDI-based chord sequences (for an example, see SOS May 2015: http://sosm.ag/cubase-0515), the transpose features can be a handy alternative — I’ll use the creation of an EDM-style chord sequence to illustrate this. The screenshot shows an eight-bar sequence ‘starting point’, where the rhythmic nature of the part is defined but the part currently comprises just a single chord. If you lack the keyboard skills to spice this up, or an understanding of what chords might work alongside your starting chord, a combination of setting the project’s key/scale (done via the Chord Track) and the MIDI Transpose Setup dialogue can help. 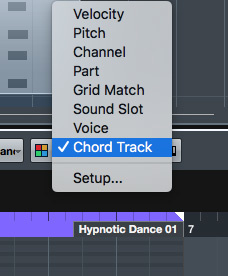 First, insert a Chord Track into your project and, in the Inspector, switch off the Automatic Scales option. Then, in the track’s Track Control panel, set Show Scales to On. An additional lane will appear in the Chord Track, into which you can add events that define the key/scale combination from that point onwards. Next, with your MIDI clip displayed in the piano roll editor, select Chord Track in the Event Colours drop-down. Instead of the notes being colour-coded according to velocity (the default), the colours indicate whether the notes fit into the current key/scale — red notes lie outside the current key/scale. If you don’t know what key/scale combination your initial chord belongs to, you can experiment with the key/scale dialogue in the Chord Track until your initial chord contains just pale blue notes (indicating that they all lie within the current key/scale combination). There may be several acceptable combinations, though, so some trial and error will probably be required. The Transpose Dialogue can help you find new chords, keeping notes in the appropriate scale.Now to get experimental with the chord sequence. Imagine we want to find a different chord for the third and fourth bars of the sequence. After selecting just those notes, the Transpose Setup dialogue (from the MIDI menu) can apply a bit of scale-sensitive assistance. For example, the settings shown in the screenshot will transpose the selected notes by a semitone, but because Scale Correction is selected and both the current and new scale are set to the project’s scale (C-major in this example), any note movements created by the dialogue will remain ‘in scale’ (so some may move by more than one semitone). To ensure that transposition doesn’t take any notes too far from their original register, the Use Range parameter can constrain the range of allowable notes. Clicking OK applies the settings in the dialogue to the selected notes, so just repeat the process until you hear something you like. Whatever you do, you can be sure that all the notes in your new ‘chords’ will be in key/scale. While that doesn’t guarantee a musical miracle, it really doesn’t take long to create a good, dance-friendly sequence. The downside is that the Transpose Setup dialogue closes every time you hit the OK button — a quick visit to the Key Commands dialogue will allow you to configure shortcuts to open the Transpose Setup dialogue, and to repeatedly execute the current Transpose Dialogue settings without actually opening the dialogue itself. Of course, you don’t have to use the Transpose Setup approach. Having set the Chord Track key/scale and the Chord Track colour-coding in the piano-roll editor, you can move notes around in the piano-roll editor manually. As you shift all the notes of your chords up/down, if any red notes appear you can simply select these and experiment with shifting just those notes an additional step or two to see what new ‘chord creations’ manifest themselves. Yes, it’s still a case of trial and error, but at least some of the errors are being pointed out to you, and you can let your ears judge whether the occasional ‘out of scale’ note is musically acceptable or requires further tweaking. If transposing notes by hand, Chord Track-based colour-coding can help you avoid errors. Note that while this ‘dance chords’ example has focused on MIDI tracks, the same Chord Track colour-coding is available when editing monophonic audio tracks in VariAudio. If you want to experiment with transposing/re-writing your vocal melodies, for example, Cubase can give you some useful guidance. Once you’ve used these transpose tricks to create a killer dance chord vamp, you may be interested to know what the actual chords being played are, and perhaps want other MIDI tracks to follow those chords. 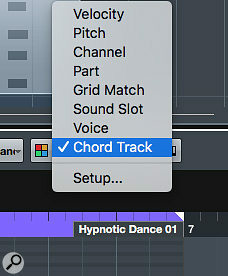 Simply right-click the MIDI clip containing your new chord sequence and choose Chord Track/Create Chord Symbols. Based on the settings you choose, this dialogue will place the relevant chord labels on the Chord Track. Finally, while VariAudio colour-coding support is helpful, wouldn’t it be cool if VariAudio added key/scale-based snapping when moving note segments? Let’s hope that this is on Steinberg’s to-do list!